Alfalfa Weevil – Larval populations of alfalfa weevil have been gradually increasing in first crop alfalfa. The WDATCP Wisconsin Pest Bulletin reported late last week their surveys in south-central and central counties yielded an average of 3 larvae per 25 sweeps in 46 fields scouted. Sweep net samples can be used to detect alfalfa weevil larvae in the field, but leaf tip feeding injury is used to determine economic threshold and need for treatment. In the same survey, WDATCP reported leaf tip feeding is generally less than 10%, however two fields in Dane County showed 30-40%. Damage is expected to become more pronounced this week, particularly if rainy weather continues to delay harvest of first crop. (Survey Information Courtesy of Krista Hamilton, WDATCP Wisconsin Pest Bulletin). Alfalfa should be harvested in the next 1-2 weeks to prevent damage by the larger and more destructive larval instars. Control is justified for fields that show 40% tip feeding and are more than 7-10 days from harvest. If 40% tip damage is noted within 7-10 days of harvest, alfalfa should be cut rather than treated. 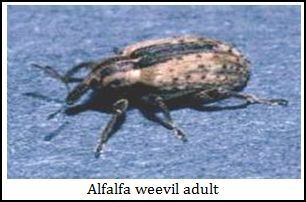 Most alfalfa weevil feeding damage is caused by the larval stages to first crop alfalfa, but adults can cause significant damage at times too and may feed on second crop regrowth. Alfalfa weevil larvae go through four instars between hatching out of the egg and spinning a silken cocoon in which to pupate. 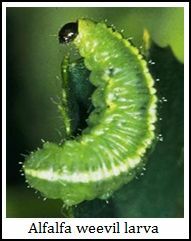 The smaller larval instars are slate-colored, but they become a bright green by the time they are full-grown at 3/8 of in inch length. Later instar alfalfa weevils are clearly distinguished by their green color, a white stripe running down their back and black head capsule. Alfalfa weevil adults can be identified by the dark strip down their back and their snout – like mouthparts. Natural enemies do an excellent job of controlling the alfalfa weevil including several small, non-stinging species of wasps responsible for keeping weevil populations below treatment levels. There is also a fungal pathogen that attacks weevil larvae and can decimate weevil populations in a few days. Although these natural control factors are effective, conditions may not always be favorable for acceptable results. Always use timely field scouting before making control recommendations. Potato Leafhopper – Courtesy of WDATCP’s Wisconsin Pest Bulletin, survey observations last week indicate that the first distinct arrival of potato leafhopper adults has occurred. Potato leafhopper adults overwinter in the southern U.S. and migrate to the Upper Midwest typically in late May to Mid-June. Surveys last week found adults in 5 of 9 fields checked in Columbia and Dodge counties, and as far north as Taylor in Jackson County. The last two years, we have seen fairly low potato leafhopper populations overall in Wisconsin. Scout alfalfa fields beginning with second crop re-growth as arrival of adults brings potential of sharp increase in populations in June. To obtain an accurate population estimate, sample for leafhoppers when alfalfa is dry, and avoid field edges. 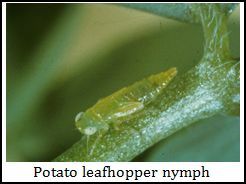 Cold, wet or windy conditions may temporarily knock adults and nymphs from plants, resulting in an inaccurate sweep count. Use a standard 15-inch diameter insect sweep net. A total of 100 sweeps should be taken throughout the field, in an approximate “M-shape” through the field to obtain 20 consecutive sweeps in each of 5 randomly selected areas. Click here to view an instructional UW Extension video titled Scouting Alfalfa for Potato Leafhopper. Economic thresholds are based on average number of potato leafhoppers/sweep. Keep a running total of the number of leafhoppers caught and divide by 100. Nymphs are not generally recovered in the bottom of the sweep net with adults, but found along the collar of the net (along the wire hoop rim of the net). Nymphs move quickly, typically sideways, when disturbed. The larger the alfalfa the more PLH it takes to cause economic damage. This occurs both because the older plant is more tolerant of damage and because the PLH will be on the plant less time before it is harvested. Potato leafhopper has 3-4 generations per year in the Midwest, so this is an insect to continue monitoring for the remainder of this season. 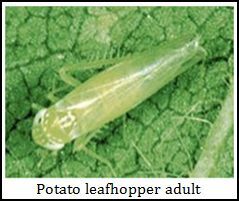 Natural predators and parasites of the potato leafhopper do not typically provide consistent economic suppression of leafhopper. Consult UW-Extension bulletin A3646 Pest Management in Wisconsin Field Crops for insecticide label information (potato leafhopper rates, pre-harvest interval, restricted entry intervals, and precautions to avoid honey bee kill).